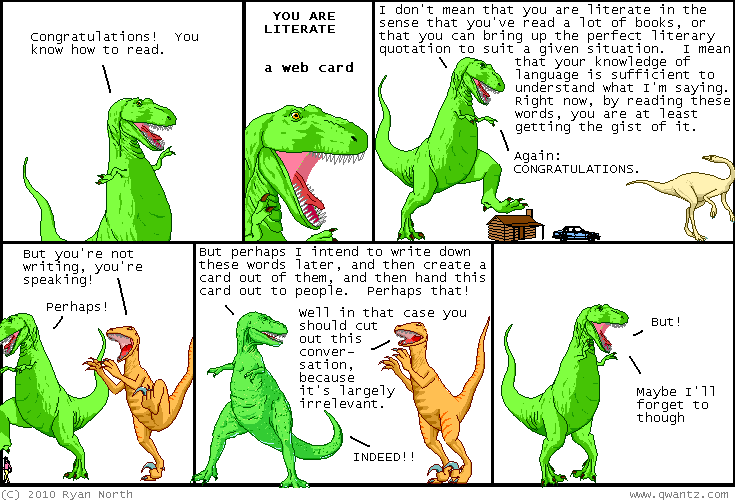 Dinosaur Comics - January 29th, 2010 - awesome fun times! January 29th, 2010: Yesterday I posted on Twitter to a great comic called AXE COP, the only written by a 5 year old, but drawn by his 29-year-old brother. Unfortunately the site went down but until it's back up, you can read the mirrored comics here! Axe Cop, you guys! One year ago today: i've eaten so many friggin' animals!! i've eaten ALL the friggin' animals.